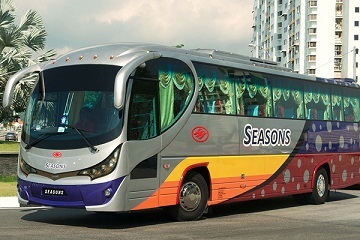 Seasons Express is a bus operator that based in Bayan Lepas, Penang. The company is one of the largest and reputable bus operators in Penang and they have successfully expanded their bus service network to Singapore by setting up a new office in Singapore Golden Mile Complex. Today, Seasons Express has a wide range of bus routes to various parts of Peninsular Malaysia and Singapore by operating in various bus terminals, such as TBS (Terminal Bersepadu Selatan), 1U Bus Terminal, KL Sentral and others. Seasons Express buses are famous with its timely departure and direct route service. For example, their buses from Penang to Melaka and Seremban is direct bus without stopping in Kuala Lumpur. To ensure that the passengers are in an enjoyable ambience along the bus trip, the company offers express buses with full-conditioned bus coach and spacious legroom. Reclining seats are equipped in their buses, so that passengers can take a good nap throughout the journey. 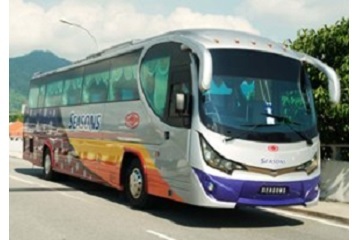 Seasons Express provides comprehensive bus routes departing from Penang to various destinations like Melaka Sentral, 1U Bus Terminal, Hentian Duta and more. As the company has also expanded to Singapore, they offer bus routes from Singapore to places in Malaysia, such as Seremban, Berjaya Times Square and TBS (Terminal Bersepadu Selatan). There are several buses trips operate from Singapore to TBS (Terminal Bersepadu Selatan) and Berjaya Times Square daily.